On stories for boys and reluctant readers – Max and his black dog. In a departure from the norm, I thought I’d share with you one of a series of extended stories I have written for reluctant readers, with a protagonist called Max who is little inspired by school and yearns to be anywhere but school. Max is based on a number of young boys I have worked with who have great skills and many talents beyond the classroom, but struggle to cope with the demands of the school day. 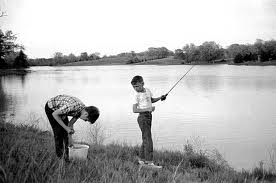 One young man in particular, inspired me to write stories, with his love of fishing, tales of adventure and his longing to explore the great outdoors. Max and his best mate Pete had to work as partners in class. They had a big history project to finish before the end of the week. Max thought it was boring. He didn’t want to do any more writing. He couldn’t write. His spelling was awful. He didn’t want to do the project. He didn’t want to do any more reading. He didn’t like reading. It was hard work, and he didn’t think he could read well. Not like some of the other boys in his class. Some were really brainy. Everything was easy for them. Everything was easy for Pete too, which was why he made such a good partner for Max. Also he was older, but Max suspected, even if Pete was the same age, he would still be better than Max at almost anything. Pete kept on finding things to share with Max. Sometimes he got really excited and walked around, holding a book and reading out loud, talking loud and fast. The teacher told him to sit down once, but she didn’t mind really, because she could see that Pete was working. The teacher wasn’t so kind with Max. She came over many times to ask him to concentrate, to work with his partner, to not let Pete do all the work. Pete was very good and stuck up for Max and but Max knew really that it was Pete who was the brainy one. Max didn’t know what Pete was talking about half the time. Max pretended to listen but really he was dreaming. He day-dreamed a lot about all the things he could be doing, if he didn’t have to be at school. 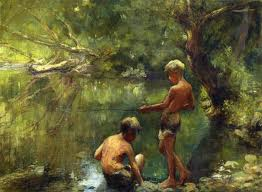 Max imagined himself out on the river bank, fishing, or alongside the canal with a fishing-net at his side, full of shiny, fat fish. The sky was blue and the weather hot and he was wearing his own clothes, not his school uniform. Max saw himself with Pete, pac king bags with a few sandwiches, crisps and a drink and setting off on their bikes. He saw himself riding along an open lane, free-wheeling down-hill. He could feel the wind against his face and the breeze, and the freedom. He could see the blue sky and feel the heat of the sun. He could hear the birds singing in the trees and in the fields. He could see the green of the hedge-row and the dusty grey of the road ahead. Max saw all this in his head, but when he looked around him, there was only a classroom full of boys and girls, his teacher, and lots of books. He remembered that it was just another school day. The end of the week was getting closer and the history project wasn’t finished. They hadn’t even agreed what they were writing about. Max and Pete couldn’t agree who to write about. They had to choose a famous person in history, who had made a difference to the world. Max didn’t think he knew any famous person in history. When he was at school, he didn’t feel like he knew much at all, but when he was out of school – that was a different story. Pete kept on choosing books, and reading about different people. He was doing most of the work, but he was a good mate, and he didn’t complain. He knew that Max didn’t enjoy reading and he knew that he was a better reader than Max. And better at spelling, and writing, and remembering to get his homework in on time. Sometimes Pete wondered if Max really tried at all, or if he just couldn’t be bothered. And then sometimes Pete wondered why he should be the one who cared when there were teachers who should help Max more. Pete began to read a book about Winston Churchill. He had found a chapter in a book about famous people that was all about Winston Churchill in his days as Prime Minister. Pete wanted Max to listen to him and to agree that this could be their famous person. He was getting tired of Max pretending to listen and doing nothing. He knew that Max didn’t really want to do the project but he didn’t want to do everything by himself. Pete wished their teacher had given him a different partner. Then he felt bad that he wanted to work with someone else. Max was his best mate. He had to stick up for him, but it was hard work sometimes, and he couldn’t get everything done that he wanted to himself. Pete began to read about Churchill. He read about different parts of his life. He tried to get Max to listen, but Max just yawned and looked out of the window. Max had his head on his hands. He felt sad that so many good days should be spent like this. He wished he didn’t have to come to school. He wished he had more time to do what he wanted to do. He wished – so many things. Max thought about home. He thought about his Mum being cross with him in the morning because he hadn’t done his homework. He had spent the weekend at his Dad’s and had been too busy to do homework. He had been outside, doing more important things. He had been on a long bike ride. He had been fishing with his Dad. They had sat in silence, for almost a whole day, catching just one or two small fish. It had been a good day. Max’s Mum couldn’t see how that could be a good day, but to Max it was. He didn’t think his Mum had ever been fishing. She couldn’t understand what it was like. How much he liked the peace and quiet and no one making demands of him or being cross or angry about silly things like homework. But then, somehow, he had not managed to catch up with all the other things he had to do for school. His Dad didn’t worry about homework like his Mum did. His Dad didn’t think it was important. Max thought about all these things. He felt miserable and alone. His life was hard. Why didn’t people realize that when they wanted him to do so many things. Everywhere he went there were different rules, one lot of rules at home, one lot of rules at his Dad’s, one lot of rules at school. It was all too complicated for him. Pete was going on about Churchill’s black dog. Pete could be annoying sometimes, trying to catch him out, like a teacher. Max caught a little of what Pete was saying. He heard something about a black dog. Max scowled at Pete. They were best mates but that didn’t mean Pete didn’t bug him sometimes. He was just too clever, always working hard at school. Pete was smiling. ‘Yeah, sounds like you were listening. He didn’t keep a black dog. He became depressed sometimes and that was the name he gave to his depression. He called it his black dog. It says so here, look!’ Pete handed Max the book. It showed a picture of a large man, wearing a bowler hat and smoking a fat cigar. He didn’t look like a man who could ever be depressed. Pete kept on talking. Max began to listen. How could this man who was so important and famous be unhappy? How could he do anything if he was depressed? Max found himself getting interested. Pete kept reading on, more and more from his book. They discovered lots of information about World War 2. They saw lots of photographs of Churchill in a big coat, smoking a cigar. Max thought Churchill looked the most powerful man in the world. Pete read about World War 2 and the air-raids on Britain and the blitz on London. He read about how Churchill walked around the rubble of thousands of blown up houses. 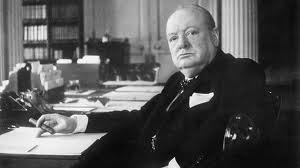 He wondered how Churchill could be so brave, so unafraid. Max smiled to himself. He thought about his life. About all the problems that sometimes made him feel so small and unhappy. And he thought about this great man and all the problems he had to deal with, to help protect the country during the war. Suddenly Max didn’t feel so sad anymore. It wasn’t always a waste of time being in school. He felt a huge black cloud lift from his shoulders. He turned around. He thought he saw a large black dog leave the classroom. Max smiled. He thought about Winston Churchill. His black dog had left him. ‘Let me have a look then’ he called across to Pete. He reached for the book and looked up at Pete. ‘Better late than never’ said Pete. They both began to laugh. Comments are always welcome – what do you think?